While original Natural Calm promotes sleep through natural relaxation, Calmful Sleep was developed specifically for those times we need extra sleep support. Calmful Sleep Calmful Sleep is a delicious nutrient-rich sleep formula with an organic Mixed Berry flavor, sweetened with organic stevia. 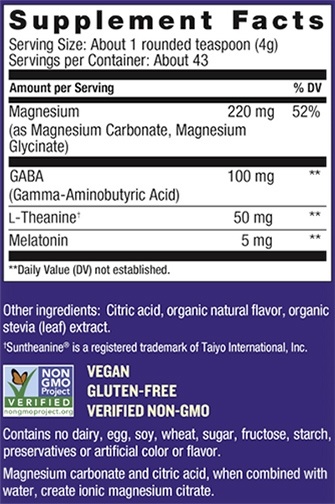 Along with Natural Calm, it features rest-promoting magnesium glycinate, Suntheanine® (a patented premium form of the relaxing amino acid L-theanine), calm-enhancing GABA (a non-protein amino acid) and melatonin, which helps the body ease into restful sleep. Just add water (preferably hot), let it fizz, then drink—and then . . .
All the benefits of multi-award-winning Natural Vitality’s Calm plus a unique formula to promote muscle relaxation and recovery. Includes the amino acid L-carnitine to support fatty acid metabolism, as well as bromelain, a proteolytic enzyme complex derived from the pineapple plant. Delicious tangy organic watermelon flavor. Vegan, gluten free, and GMO-free. HOW DOES NATURAL VITALITY’S CALMFUL MUSCLES WORK?